This post reports on a bilateral filter implementation that improves processing time from 32ms to 0.25ms. The Kinect (for Windows) depth data are subject to some uncertainty that comes with its resolution. 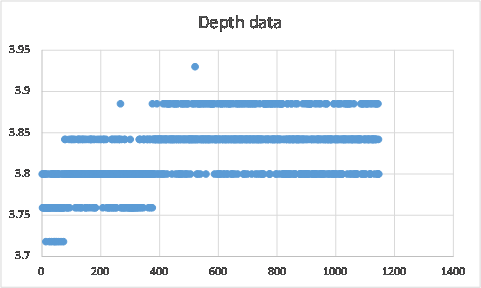 Depth estimates are defined in millimeters, and typically, subsequent depth measurements by the Kinect vary by a fixed amount. De graphs show two tendencies. One is that variance is one unit above, or one unit below the average practically all of the time, the second tendency is that the average changes a bit before it stabilizes. Here we see it change from about 3.76m via 3.8m to about 3.84m. If the Kinect depth data is projected onto an image this variation translates into a nervous jitter. Since I do not particularly care for a nervous jitter, I would like to stabilize the depth data a bit. The Kinect for Windows SDK (1.6) contains a whitepaper on skeletal joint smoothing. The paper deals with the reduction of noise in the Kinect skeletal tracking system. 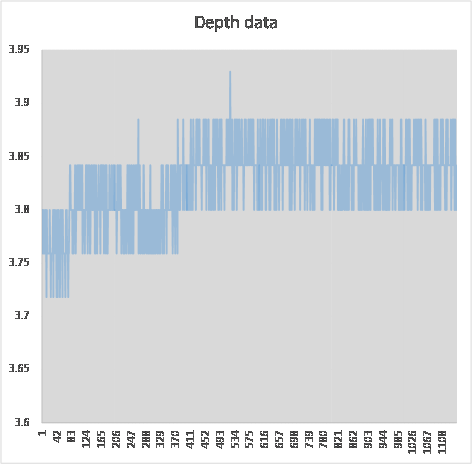 This tracking system employs the same depth data, and therefore suffers from the same problem. The proposed solution is to filter the data over time. The depth measurement z(x,y)(t) of a location (x, y) at time t can be averaged over a number of measurements in the past at the same location: z(x,y)(t-i) where i is in [1, n]. The suggestion is to take n not too large, say 5. Averaging can also be over measurements in the future. This implies that one or two frames are included in averaging before an image based on the depth image is rendered, hence there is a latency in rendering equal to the number of ‘future’ frames included in averaging. The advantage of considering the ‘future’ is that if the measured scene changes (or a player changes position – in skeletal tracking), another type of averaging can be applied, one that is better suited for changes and e.g. puts a heavier weight on recent measurements. I’ve done an experiment with temporal filtering, but it was not satisfactory. The fast and nervous jitter just turns into a slower one that is even more disturbing because short periods of stability make changes seem more abrupt. Another approach is not to average over measurements at the same location through time, but to average within one frame, over several proximate measurements. A standard solution for this kind of filtering is the Bilateral filter. The Bilateral Filter is generally attributed to Carlo Tomasi and Roberto Manduchi. But see this site where it is explained that there were several independent discoveries. The idea behind the Bilateral Filter is that the weight of a measurement in the average is a Gaussian function of both the distance and the similarity (in color, intensity, or as in our case: depth value). The similarity term prevents edges to be ‘averaged out’. The Bilateral Filter works well, the only drawback it has is its computational complexity: O(N^2) where N is the (large!) number of pixels in the image. So, several people have been working on fast algorithms to alleviate the computational burden. To me it seems that Ben Weiss provided a good solution, but it is not generally available. The solution by Frédo Durand and Julie Dorsey (2002), and the elaboration of this work by Sylvain Paris and Frédo Durand (2006), all from MIT, seems to be the leading solution, and is general available – both the theory and example software. Their method has a project site that is here. In a nutshell, the method by Sylvain Paris and Frédo Durand reduces processing time by first down sampling the image, then applying a convolution to compute the averages, and finally scaling up the image again while clamping over out-of-bounds values. So in essence, it operates on a (cleverly) reduced version of the image. I’ve downloaded and compiled the software – the really fast version with the truncated kernel – and it requires about 0.032s to process a ppm image of 640×480 pixels (grayscale values), where the spatial neighborhood is set to 16 (pixels) and the ‘similarity’ neighborhood is set to 0.1, so grayscale colors that differ more than 0.1 after transformation to normalized double representation, are not considered in the average. See the image below for a screen shot. The processing time is, of course, computer dependent, but my pc is not really slow. Although 32ms is a fine performance, it is too slow for real-time image processing. The Kinect produces a frame 30 times per second, i.e. every 33ms, and we do not want to create a latency of about one frame just because of the Bilateral Filter. In order to improve on the processing time of this fast algorithm I’ve written a C++ AMP program inspired by the CPU implementation, this program runs on the GPU, instead of on the CPU. For information on C++ AMP, see here and here. What I think is great about AMP is that it provides a completely general access to General Purpose GPU computing. Having said that, I must also warn the reader that I do not master it to the degree that I could guarantee that my implementation of the Bilateral Filter in C++ AMP is representative of what could be achieved with C++ AMP. the picture below, made with my ATI Radeon HD 5700 Graphics card. What you see here is a variety of timings of the computational phases. The top cycle takes 1.1ms, the middle one takes 1.19, and the bottom cycle takes 1.07ms. So, what is in the cycle? 1. The image is loaded into the GPU, and data structures are initialized. If you want to know more on ‘warming up’ the data and the code, see here. Since it takes 0.5 to 0.6 ms it is obviously the bottle neck. 2. Down sampling the image to a smaller version takes around 0.1 ms.
3. Computing the convolution takes 0.35 ms. This is the real work. 4. Up scaling and clamping takes again 0.1 ms.
A processing time of about 1 ms is satisfactory as a real-time processing time. 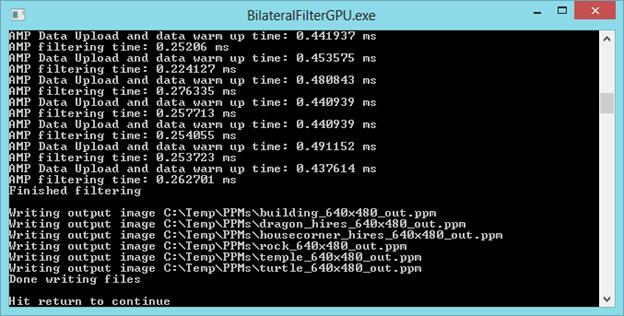 Moreover, since we may assume the data is already in GPU memory (we need it there to render it to the screen), GPU upload time is not an attribute of an application of the Bilateral Filter in this context. So we may think of the processing time as being about 0.55 ms. which is absolutely fabulous. At about this time, I bought a new graphics card, an Asus NVidia GTX690 (which for the purposes of this application yields the same results as a GTX 680, I know). This card was installed in my pc. Ok, I didn’t buy a new motherboard, so data is still being uploaded through PCI-e 2.0 and not through PCI-e 3.0 16x (but in time…). So, will this make a difference? Yes, it does. Look at the screen shot below. 1. Data uploading and the warming up process now takes about 0.45 ms.
2. Filtering now takes about 0.25 ms.
From 32ms to 0.25ms. Most satisfying! 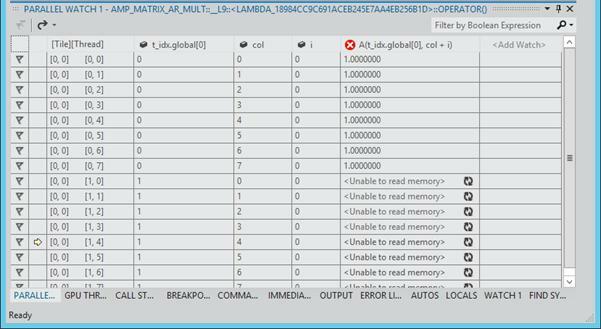 Large vector-matrix inner products by the GPU are 250 times faster than straight forward CPU implementations on my PC. Using C++ AMP or a Compute Shader the GPU realized a performance of over 30 gFLOPS. That is a huge increase, but my GPU has a “computational power” (whatever that may be) of 1 teraFLOP, and 30 gFLOPS is still a long way from 1000 gFLOPS. This article presents a general architectural view of the GPU and some details of a particular exemplar: the Ati Radeon HD5750. Then code examples follow that show various approaches to large vector-matrix products. Of course the algorithms at the end of the article are the fastest. It is also the simplest. Programming the GPU is based on an architectural view of the GPU. The purpose of this architectural view is to provide a unified perspective on GPUs from various vendors, hence with different hardware setup. It is this unified architecture that’s being programmed against using DirectX11. A good source of information on Direct Compute and Compute Shaders is the Microsoft Direct Compute BLog. The architecture described below is based on information from Chas Boyd’s talk at PDC09, as published on Channel9. Of course, this blog post only presents some fragments of the information found there. A GPU is considered to be build from a number of SIMD cores. SIMD means: Single Instruction Multiple Data. By the way, the pictures below are hyperlinks to their source. 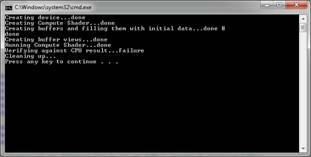 The idea is that a single instruction is executed on a lot of data, in parallel. The SIMD processing unit is particularly fit for “data parallel” algorithms. A GPU may consist of 32 SIMD cores (yes, the image shows 40 cores) that access memory with 32 floats at a time (128 bit bus width). Typically the processor runs at 1Ghz, and has a (theoretical) computational power of about 1 TeraFLOP. 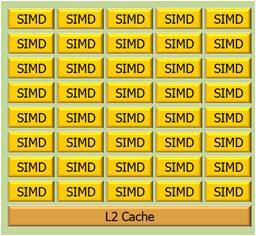 8 Kbyte SIMD shared memory, L1 cache. The GPU as a whole has typically 1Gb of general RAM. Memory access bandwidth is typically of order 100GBit/s. A GPU is programmed using a Compute Shader or C++ AMP. Developers can write compute shaders in HLSL (Looks like C) to be executed on the GPU. AMD is a C++ library. The GPU can run up to 1024 threads per SIMD. A thread is a line of execution through code. The SIMD shared memory is shared among the threads of a SIMD. It is programmable in the sense that you can declare variables (arrays) as “groupshared” and they will be stored in the Local Data Share. Note however, that over-allocation will spill the variables to general RAM, thus reducing performance. Local variables in shader code will be stored in registers. 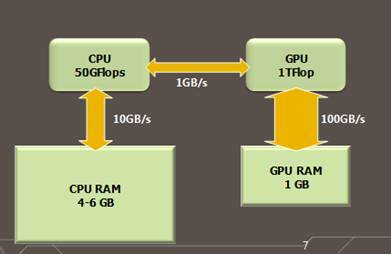 The GPU architecture suggests programming tactics that will optimize performance. Do your program logic on the CPU, send the data to the GPU for operations that apply to (about) all of the data and contain a minimal number of alternative processing paths. Load as much data as possible into the GPU general RAM, so as to prevent the GPU waiting for data from CPU memory. Cache data that you reuse in “groupshared” Memory. Don’t cache data you don’t reuse. Keep in mind that you can share cached data among the threads of a single group only. Use as much threads as possible. This requires you use only small amounts of cache memory per thread. Utilize the GPU as efficiently as possible by offering much more threads to it than it can process in a small amount of time. Plan the use of threads and memory ahead, then experiment to optimize. Loading data from CPU memory into GPU memory passes the PCIe bridge which has a bandwidth, typically of order 1GBit/s; that is, it is a bottleneck. So, you really like to load as much data onto GPU memory before executing your code. 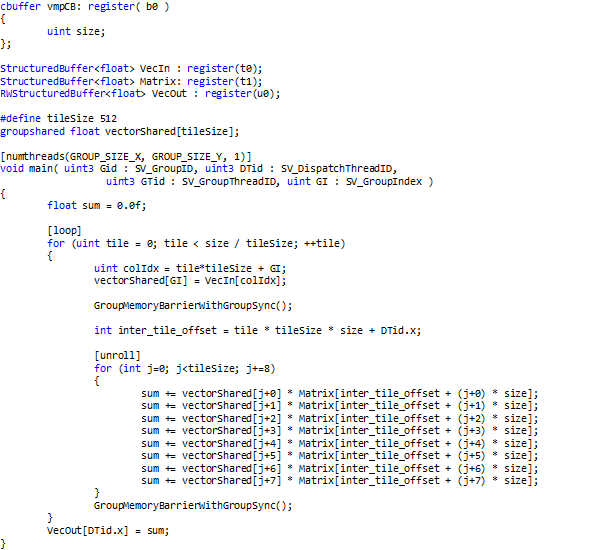 The trick in planning your parallelism is to chop up (schedule, that is J ) the work in SIMD size chunks. You can declare groups of threads; the size of the groups and the number of groups. A group is typically executed by a single SIMD. To optimize performance, use Group Shared Memory, and set up the memory consumption of your thread group so it will fit into the available Group Shared Memory. That is: restrict the number of threads per group, and make sure you have a sufficient number of groups. Thread groups are three dimensional. My hypothesis at this time is that it is best to fit the dimensionality of the thread groups to match the structure of the end result. More about this below. Synchronization of the threads within a thread group flushes the GroupShared Memory of the SIMD. A register typically has a lifetime that is bound to a thread. Individual threads are member of several groups – depending on how you program stuff. So, intermediate results aggregated by thread groups can be stored in registers. Does My ATI Radeon HD5750 GPU Look Like This Architecture… A Bit? The picture below (from here) is of the HD5770, which has 10 SIMD cores, one more than the HD5750. 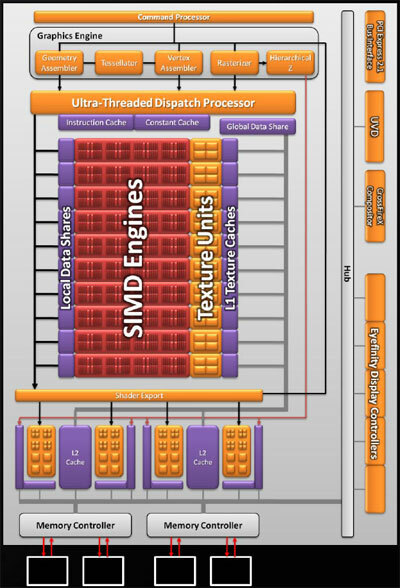 SIMD engines. We see 10 cores for the HD5770, but there are 9 in the HD5750. Each core consists of 16 red blocks (streaming cores) and 4 yellow blocks (texture units). Registers (light red lines between the red blocks). L1 Textures caches, 18Kbyte per SIMD. Local Data Share, 32 Kbyte per SIMD. L2 caches, 8 Kbyte each. Not visible is the 1Gb general RAM. The processing unit runs at 700Mhz, memory runs at 1,150Mhz. Over clocking is possible however. The computational power is 1,008 TeraFLOP. Memory bandwidth is 73.6 GBit/s. So, my GPU is quite a lot less powerful than the reference model. At first, a bit disappointing but on the other hand: much software I write for this GPU cannot run on the PCs of most people I know – their PCs are too old. Below we will see a number of approaches to vector-matrix multiplication discussed. The will include measurements of time and capacity. So, how do we execute the code and what do we measure? Times measured include a number of iterations that each multiply the vector by the matrix. Usually this is 100 iterations, but fast alternatives get 1000 iterations. The faster the alternative, the more we are interested in variance and overhead. Do not include data upload and download times. Concern an equal data load, 12,288 input elements if the alternative can handle it. Correctness check; computation is also performed by CPU code, reference code. Run a release build from Visual Studio, without debugging. Allow AMP programs get a warming up run. 2 / ms x Rows / 1000 x Cols / 1000, where ms is the average time in milliseconds. The result of the test is correct. Although this blog post is about GPU performance, I took a quick look at PPL performance. We then see a performance gain of a factor 2, but the result is incorrect, that is, the above code leads to indeterminacy in a parallel_for loop. I left it at that, for now. We can of course, view a vector as a matrix with a single column. The C++ AMP documentation has a running code example of a matrix multiplication. There is also an accompanying compute shader analog. Here: amp is an alias for the Concurrency namespace. The tile size TS has been set to 32, which is the maximum; the product of the dimensional extents of a compute domain should not exceed 1024. The extent of the compute domain has been changed to depend on B, the matrix, instead of the output vector. The loop that sums element products has been unrolled in order to further improve performance. As mentioned above, we start with a warming up. As is clear from the code we do not measure data transport to and from the GPU. Time measurements are over 100 iterations. The average run time obtained is 9,266.6 ms, hence 0.01 gFLOPS. The result after the test run was correct. The data load is limited to 7*1024 = 7,168; that is 8*1024 is unstable. 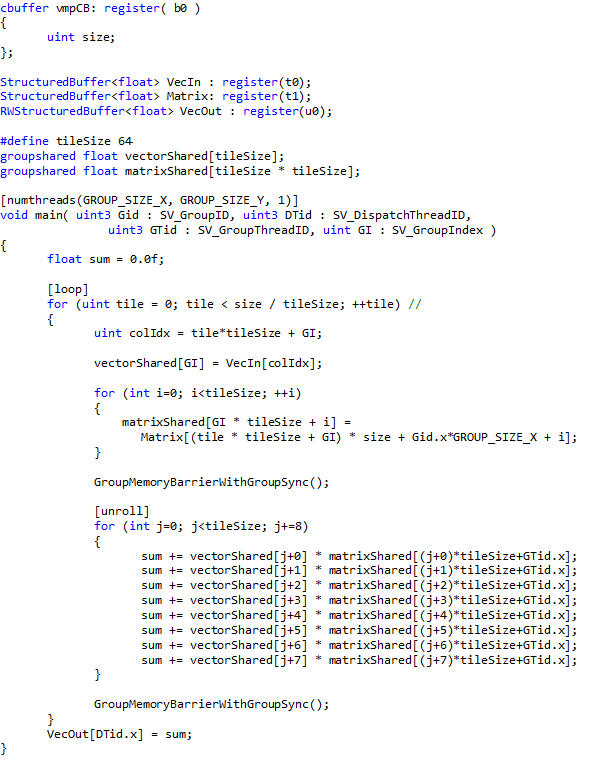 The variables Group_SIZE_X and Group_SIZE_Y are passed into the shader at compile time, and are set to 32 each. Time measurements are over 100 iterations. The average run time obtained is 11,468.3 ms, hence 0.01 gFLOPS. The result after the test run was correct. The data load is limited to 7*1024 = 7,168; that is 8*1024 is unstable. The performance of the compute shader is slightly worse that the AMP variant. Analysis with the Visual Studio 11 Concurrency Visualizer shows that work by the GPU in case of the compute shader program is executes in small spurts, separated by small periods of idleness, whereas in the AMP program the work is executed by the GPU in one contiguous period of time. For any value of t_idx.global – which is based on the extent of the matrix- that is unequal to zero, vector A does not have a value. So, in fact, if N is the number of elements in the vector, we do O( N3)retrievals but only O(N2) computations. So, we need an algorithm that is based on the extent of a vector, say the output vector. Somehow, it proved easier to develop the vector-matrix product as a compute shader. This is in spite of the fact that unlike AMP, it is not possible (yet?) to trace a running compute shader in Visual Studio. The idea of the algorithm is that we tile the vector in one dimension, and the matrix in two, thus obtaining the effect that the vector tile can be reused in multiplications with the matrix tile. This program can handle much larger amounts of data. Indeed, this program runs problem free for a vector of 12,288 elements and a total data size of 576 Mbyte. Using an input vector of 12,288 elements, with total data size of 576 Mbyte. The time performance is 10.3 ms per run, averaged over 1,000 runs, which amounts to 29.3 gFLOPS. The result of the final run was reported to be correct. The matrix is a vector with size * size elements. He tile size was chosen to be 128, because that setting yields optimal performance. The program was run on an input vector of 12,288 elements again, with total data size of 576 Mbyte. The time performance is 10.1 ms per run, averaged over 1000 runs, which amounts to 30.0 gFLOPS. The result of the final run was reported to be correct. We see here that the performance has much improved. When compared to the reference case, we can now do it (in milliseconds) 2,452 : 10.1 = 243 : 1, hence 243 times faster. Note the tileSize of 512(!). This program was run for a vector of 12,288 elements and a total data size of 576 Mbyte. The time performance is again 10.3 ms for a multiplication which amounts to 29,3 gFLOPS (averaged over 1000 runs). The result of the final run was reported to be correct. So, indeed, caching the matrix data does not add any performance improvement. Time performance is optimal for a tile size of 128, in case the number of vector elements is 12,288. We obtain an average run time of 9.7 ms (averaged over 1,000 runs), and a corresponding 31.1 gFLOPS. The result of the final run was correct. This program is 2452 / 9.7 = 252.8 times as fast as the reference implementation. Developing an algorithm for vector-matrix inner product has demonstrated comparable performance for Compute Shaders and AMP, but much better tooling support for AMP: we can step through AMP code while debugging, and the Concurrency Visualizer has an AMP line. This better tool support helped very well in analyzing performance of a first shot at the algorithm. The final algorithm proved over 250 times faster than a straight forward CPU program for the same functionality. Detailed knowledge of the GPU architecture, or the hardware model, proved of limited value. When trying to run the program with either the maximum nr of threads per group, or the maximum amount of data per Group Shared Memory, I ran into parameter value limits, instabilities, performance loss, and incorrect results. 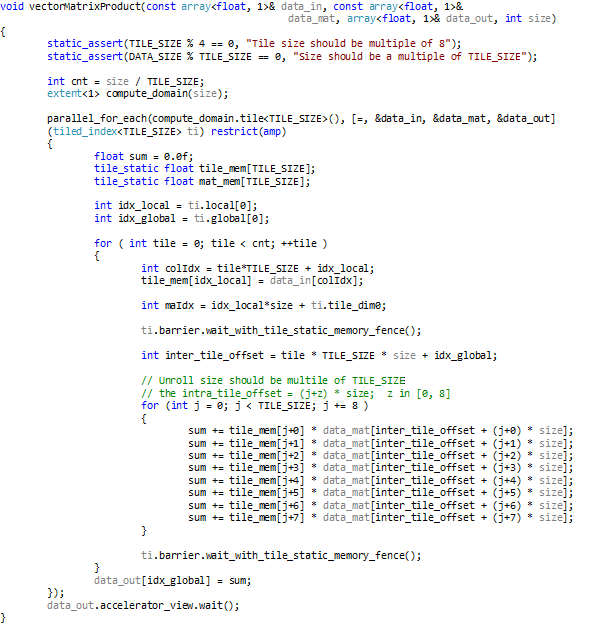 I guess, you will have to leave the detailed optimization to the GPU driver and to the AMP compiler. One question keeps bothering me though: Where is my TeraFLOP? I mean, Direct Compute was introduced with the slogan “A teraFLOP for every one of us”, AMP is built on top of Direct Compute, and my GPU has a computational power of 1.08 TeraFLOP. Am I not ‘one of us’? The AMP team has updated the N-Body Simulation code to turn it into a clean port that relates to the Compute Shader original in a comprehensible way. Now it has comparable performance to the original (optimized) version (both versions do >330 gFLOPS at >30 fps for 23,040 particles on my pc). I’m impressed. For one, by the attitude of the AMP people that energetically reacted to issues which other people / teams might well have dismissed as unimportant. Then there is the point that you get maximum performance from a set of very powerfull processors with code that is very short compared to the direct compute code you had to write otherwise, and this code, by AMP design, is very elegant as well. Of course, there is a risk in short and elegant code: subtle differences in code can make substantial differences in performance, hence developing AMP code is rather knowledge intensive. But I kind of like that. The results below were brought to the C++ AMP forum for discussion. Daniel Moth advised to update the driver of the graphics card. This update made a tremendous difference for two of the three programs mentioned below for which now C++ AMP performance is equal to or better than Compute Shader performance. The discussion on the N-Body Simulation program, which is heavily optimized in the Compute Shader version is still open, mainly because the required information is not available yet. I expect that also in this case C++ AMP will prove to be equipotent to Compute Shader programs. Now, what have we learned from this exercise? For one, a lot about Compute Shader optimization and the mechanisms of GPU computing performance. This is an interesting and instructive subject. I also have learned that C++ AMP performance is comparable to Compute Shader performance. However, I do not (yet) understand if and how this will always and necessarily be the case, and that still itches a bit. Up to date, I find that Compute Shader based programs outperform C++ APM programs both in time and space. Results of example programs I explored, which have been created by the respective product teams tend to show substantially better performance by the Compute Shader programs. These programs are the N-Body Simulation Sample; Basic Summation; and the matrix multiplication programs from the “C++ AMP for the DirectCompute Programmer” guide. Hyperlinks are provided in the sections below. So, the question is: can there be an AMP program that performs substantially better in time and space on, let’s say, large matrix multiplication (or large matrix-vector multiplication) than a Compute Shader program? C++ AMP has been built upon Direct Compute, so the answer is: not likely. Should we, alternatively, draw the conclusion that a direct compute program categorically has better performance? The NBodyGravityCS11 Sample from the June 2010 DirectX SDK. According to its documentation, it has been used for demonstration at GDC09. The N-Body Simulation Sample port for C++ AMP. According to the post on the post on the Parallel Programming in Native Code blog, it has been used for demonstrations at the AMD Fusion Developer Summit and at Microsoft Build Conference. Performance is expressed in gFLOPS. The code for the gFLOPS was copied from the C++ AMP version to the Compute Shader version. I also changed the Compute Shader version to make it write gFLOPS and the number of particles to the screen. First, I tweaked the particle count parameter to get the best gFLOP count from either program; they both peak at 16,128 particles on my PC. Then the following results (gFLOPS) were obtained for release builds, running without debugging (this was also the configuration in the comparisons below). A note on the More and Less columns: The Compute Shader version delivers 32.03% more frames per second, and the C++ AMP version 24.26% less. So crudely: the Compute Shader version is about 30% faster. 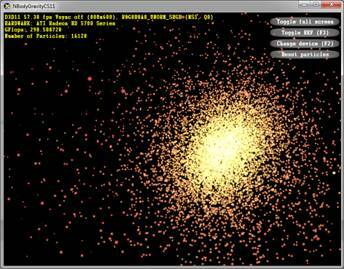 The BasicCompute11 Sample from the June 2010 DirectX SDK. An adaptation of the first example from Overview of C++ Accelerated Massive Parallelism (C++ AMP). This is also a vector addition. It was made to work with the same structs as the BasicCompute11 sample. This struct consists of an int and a float. The arrays were made global variables. A loop was added to fill the input arrays. The verification code from the BasicCompute11 sample was added. For timing, timing code was added to both programs. This timing code is from this post in the Parallel Programming in Native Code blog. For timing measurements the code was adapted as follows: In the Compute Shader program timing covers code from the Dispatch call to the Map call. In the AMP program timing covers the lambda expression, and an added array_view::Synchronize() call on the “sum” array_view. and in the case of the C++ AMP program, it either didn’t compile or produced a runtime error. Then I measured time and gFLOPS. The experiments yielded the following result. gFLOPS were measured as: 2*n / (10^6 * ms), where n is the number of elements in an array. It seems to me that the time results are too similar to call them different. The Compute Shader version has a slight space advantage. Note that since the total data size in both cases is larger than the RAM the graphics card has on board, there is some automatic sectioning going on. Both programs in this comparison come from the C++ AMP for the DirectCompute Programmer guide. This guide can be obtained from a post on the official MSDN Parallel Programming in Native Code blog. The C++ AMP program is a transformation of the Compute Shader program. The code for the starting point of the transformation is not entirely complete, so I added standard code from the BasicCompute11 Sample that loads and compiles the compute shader. Both programs measure the time spent in the “mm” function, using the timing code referred to above. This includes uploading and offloading the data onto and from the GPU. 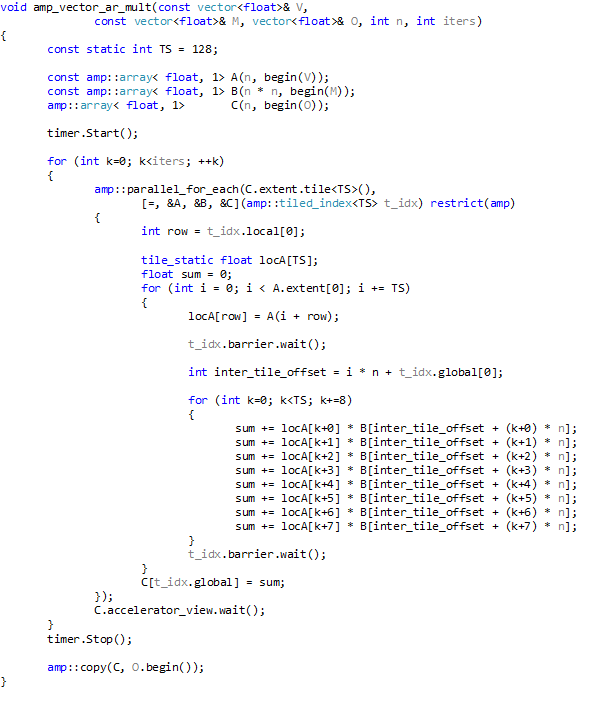 For both programs we have that any higher multiple of 64 in the number of array elements crashes the display driver. n is the size of a matrix dimension (the matrices are square). 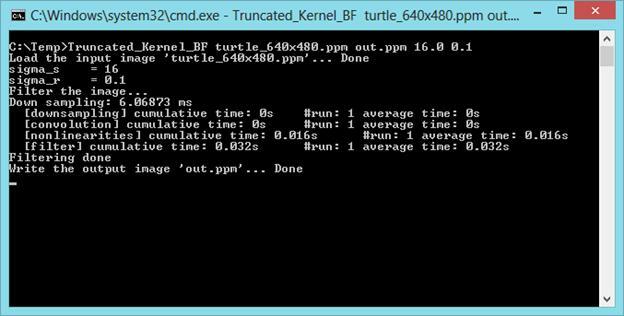 Ms is the averaged (over 10 iterations) measured processing time in milliseconds. Three program pairs have been compared, informally and semi-systematically, for their performance in time and space. In the case of the N-Body simulation, the data load was selected that is optimal for time performance. That resulted in an about 30% better time performance of the Compute Shader Program. In the case of vector addition – about the simplest program imaginable in this context – the time performance was measured for maximum data load. This resulted in practically equal time performance for both programs. The Compute Shader version can load some more data. Finally, the programs from the AMP guide for Compute Shader programmers were implemented, and the time performance was again measured for maximum data load. This resulted in a time performance of the Compute Shader that is three times as good as the time performance of the AMP program. So, conclusion, it seems that if you want to get the max from your GPU, a Compute Shader is still the way to go. As reported in a previous blog, best animation performance in Silverlight 4 is obtained from the combination of procedural animation and a pixel shader. A pixel shader is meant to be used for the manipulation of colors and transparency, resulting also in lightning and structural effects that can be expressed pixel wise. A pixel shader is not really meant to be used for spatial manipulation – spatial information is hard to come by, but see e.g. this discussion on the ShaderEffect.DdxUvDdyUvRegisterIndex property. Vertex shaders and geometry shaders exist to filter, scale, translate, rotate and filter vertices and topological primitives respectively. Another limitation of the use of shaders in Silverlight 4 is that only model 2 pixel shaders can be used, so that only 64 arithmetic slots are available. Finally, you can apply only one pixel shader to a UIElement. In order to explore the limitations on spatial manipulation and the number of arithmetic slots, I decided to build a Silverlight 4 application that does some spatial manipulation of a playing video by means of procedural animation and a pixel shader. Well, this is also my first encounter with pixel shaders, so I gathered that a real challenge would show me many sides of pixel shaders (and indeed, no disappointments here). The manipulation consists of two steps. First the video surface is reduced in size in order to create some space for the second step. In the second step, the video is divided up in a (large) number of rectangles which drift apart – disperse, while reducing in size. The second step is animated. To be frank, I’m not very excited about the results so far. It definitely needs improvement, but I need some time and a well defined starting point for further elaboration. Initial Reduction. This parameter reduces the video surface. The higher the value, the greater the reduction. Dispersion. The Dispersion parameter controls the amount of dispersion of the blocks. If you set both Initial Reduction and Dispersion to 1, you can see the untouched video. Resolution. The Resolution is a measure for the number of blocks along both the X-axis, and the Y-axis. Duration. Controls the duration of the dispersion animation. The application also has three buttons to Start, Stop, and Pause the animation of the Dispersion. The idea is that you first select an initial Reduction and a Resolution and then click Start to animate the Dispersion. The video used in the application is a fragment of “Big Buck Bunny”, an open source animated video, made using only open source software tools (and an astonishing amount of talent). The use of some procedural animation and the pixel shader results on my pc in a frame rate of about 198 FPS, and a footprint of about 2Mb video memory. This is good (though ~400FPS would be exciting), and leaves plenty of time for other manipulations of the video image. The pixel shader was created using Shazzam, an absolutely fabulous tool, and perfect for the job. The pixel shader shown below centers the image or video snapshot and reduces it. Then it enlarges it again according to the Dispersion factor. The farther away from the center, the larger the gaps are between the blocks displaying video, and the smaller the blocks themselves are. float Dispersion : register(C1); //Dispersion should never get bigger than Scale!!! In the code above, the outer “if” does the scaling and centering. The sine function and Limit variable take care of the gaps and block size. 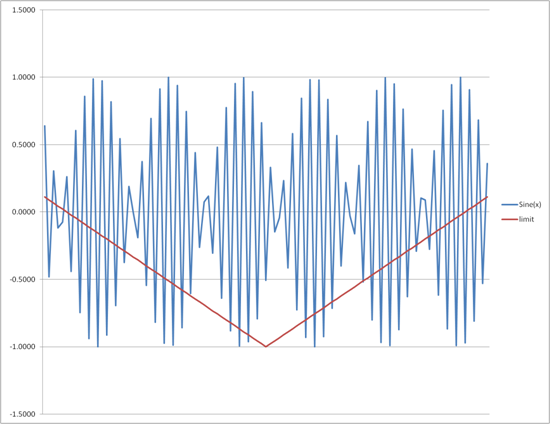 See the graph below, the Limit rises to cut off increasingly many values of the sine, thus creating smaller blocks and larger gaps. Although this is a solution for the challenge set, it is not the solution. This solution uses scaling for dispersion, but what you really would like to have is a translation per block of pixels that disperse. Needing this reveals another limitation: in Silverlight 4 you cannot provide your pixel shader with an array of structs that define your blocks layout, hence it is very hard to identify the block a certain pixel belongs to, and thus what its translation vector is. At this point I had the idea to code the block layout into a texture which is made available to the pixel shader (you can have up to three extra textures (PNG images) in your pixel shader. To create such a lookup map you have to create a writeable bitmap with the values you want, then convert this to a PNG image as Andy Beaulieu shows, using Joe Stegman’s PNG encoder. 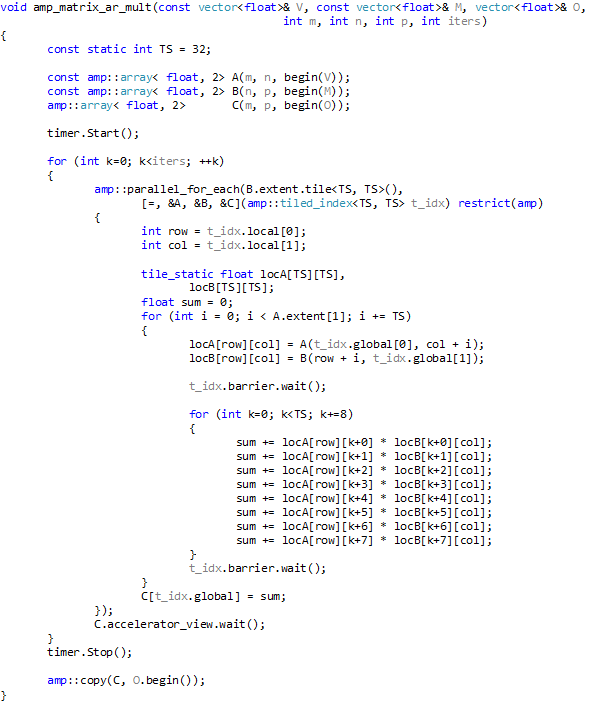 The hard part will be the encoding (and decoding in the shader). You have at your disposal 4 unsigned bytes, and you will have to encode 2D translation vectors that also consist of negative numbers. The encoding / decoding will involve a signed – unsigned conversion, and the encoding shorts (16 bit integers) as 2 bytes. This will, of course, be a feasible but tedious chore. A better move would be to invest some effort in getting acquainted with Silverlight 5 Beta’s integration with XNA, by which also vertex shaders come available. As far as the limit of 64 arithmetic slots concern, it seems that one absolutely must hit it. But then, it always seems possible to rethink and simplify your code, thus reducing its size. This limitation turned out not very prohibitive. The above pixel shader is integrated in the Silverlight application using the C# code generated by Shazzam. Then when implementing procedural animation, another limitation came up concerning manipulating videos. The initial plan was to display the video using a collection of WriteableBitmaps that could be manipulated using the high performance extensions from the WriteableBitmapEx library. However, it turns out that to take a snapshot from a MediaElement, you have to create a new WriteableBitmap per snapshot. This is expensive since we now have to create at least about 30 WriteableBitmaps per second. Indeed, running the Dispersion application (at 198 FPS) sets the CPU load to about 50% at my pc. This is not really what we are looking for. A way out is to implement the abstract MediaStreamSource class, both for the vision part as well as for the sound part of the video to be exposed. By the looks of it, this seems to be quite a challenge. However, Pete Brown has provided examples for both video and sound. And there is also the CodePlex project that provides the ManagedMediaHelpers. So, we add this challenge to the list. Another experiment might be to see if the XNA sound and video facilities can be accessed when exploiting the Silverlight – XNA integration in Silverlight 5. The challenge set turned out to be very instructive. I’ve learned a lot about writing pixel shaders, though there will be much more to learn. No doubt about that. It is absolutely true that spatial manipulation is hard in pixel shaders :-), the main cause being the extraordinary effort required to provide the shader with sufficient data, or sufficiently elaborate data. The current shader needs improvement, the next challenge in writing shaders will address Silverlight 5 (beta) and XNA. I noticed that you can achieve a lot in pixel shaders using trigonometry, and (no doubt) the math of signals. Finally, in order to really do procedural animation on surfaces playing parts of a video, you seem to need to either implement MediaStreamSource or get use the XNA media facilities. As it turns out, Storyboard animations in Silverlight have limited performance capability. Presumably this system has been designed for ease of use and developer / designer productivity. If you want to create massive amounts of animations, like for instance in particle systems, you soon hit the performance limits of the rendering, graphics, animation subsystem. Of course, now we want to know what the performance limits are, and how we can get around them. When I first hit the aforementioned performance limits, I had no clue as to how to improve performance. In this article you will find some articles I found on the World Wide Web concerning the subject. Great stuff. Some solutions found are about 20 times faster than others, and current developments of Silverlight 5 seems to promise to take it a step further. The first article encountered was How I let the trees grow by Peter Kuhn. He describes how he ran into performance problems creating a tree that grows by splitting branches into smaller branches, terminating in leaves. At some point he finds his software trying to render over 20k paths, which is ‘massive’ enough to create performance problems. The solution is found in the use of the WriteableBitmapEx CodePlex project. The WriteableBitmapEx contains (among others) a fast Blit operation for copy operations (claimed to be 20-30 times faster than the standard Silverlight operation – I believe it). You can draw on Bitmaps that are not shown yet, thus prepare images for the screen, and then quickly shove them into vision when ready. The (in browser – IE9) solution presented performs well. What we do not get from this article are clear figures about standard Silverlight performance and improved performance. So let’s discuss another article. The WriteableBitmapEx CodePlex project contains a reference to Advanced Animation: Animating 15,000 Visuals in Silverlight by Eric Klimczak. He tells us that if we want to animate ~50 objects concurrently, we need additional performance measures over Storyboards and Timelines. The main performance measures he employs extend the ones mentioned above with: “procedural animations”. In Procedural Animation within the context of Silverlight you code an Update() and Draw() Loop that is driven by the Windows.Media.CompositionTarget.Rendering event. Essentially, you now code the new position, color, or any other attribute, in the Update() method, and Blit it to the render target in the Draw() method – thus putting it on screen. This works very well! 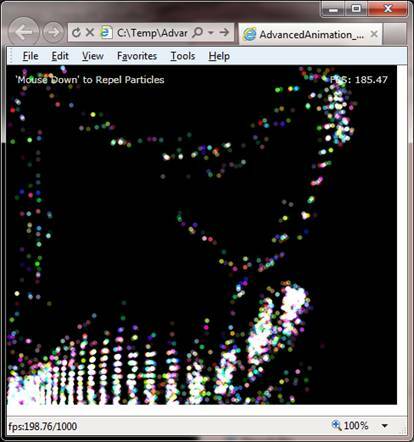 Eric Klimczak has provided source code with his article, among which a program that animates moving particles that respond quickly to mouse actions (in browser). 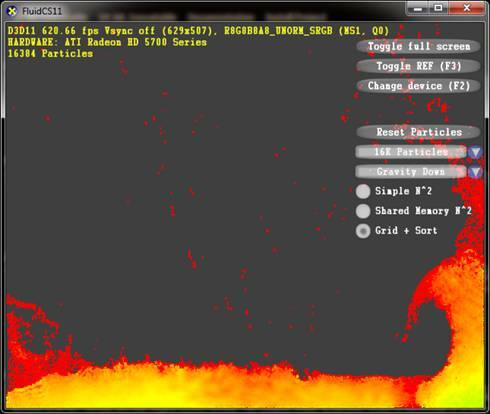 For 3000 particles the program renders at ~200 frames per second (FPS), tops, and 15.000(!) particles are rendered at a still pleasant 36 – 46 FPS. I’ve used the Silverlight FPS counter for all Silverlight programs in this article in order to get comparable measurements. See the fps counter in the status bar of the IE screenshot below. Curiously, there is no maxFrameRate setting in his code. About this maxFrameRate setting the Silverlight documentation writes: “A value of approximately 60 frames-per-second should be reliable on all platforms. The 1000 and 30000 frames-per-second range is where the maximum frame rate could differ between platforms”. So, the obvious step is to set the maxFrameRate to 1.000 – both in code as well as in the html host, which showed a factor 3 performance increase compared to the original article software, for the 3K particle case (screenshot above). The Silverlight Documentation also states that the enableGPUAcceleration setting doesn’t work for the WriteableBitmap, so I skipped that one. It seems to me that this approach solves most problems. However, procedural animation – a gaming software approach – opens the door to other, even more apt approaches. Note that this approach does not employ the GPU. All rendering is done using the CPU. An approach that takes performance a step further is Silverlight 3 WriteableBitmap Performance Follow-Up by René Schulte. In this article a number of approaches are compared. All approaches yield comparable results, except the pixel shader approach, which yields a factor ~20 better performance compared to the WriteableBitmap (WOW!). How does it work? UIElement descendants have an Effect property. You can create custom Effects using a pixel shader written in HLSL (a .fx file) which you compile using e.g. 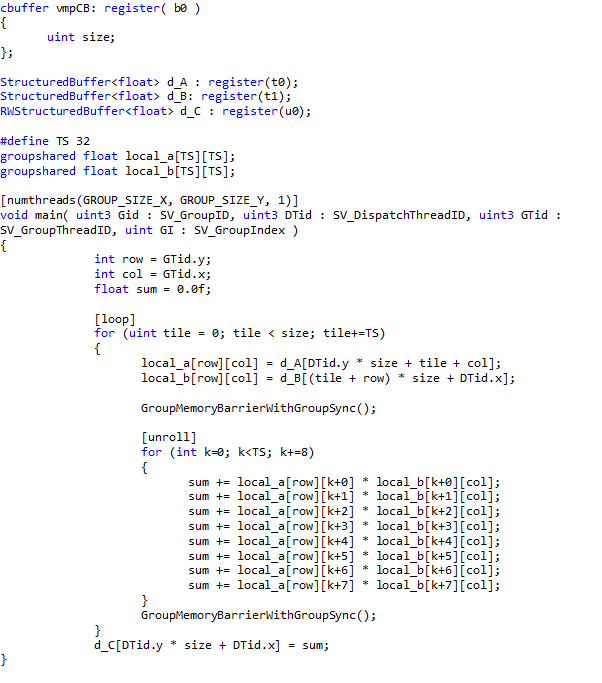 fxc.exe – the DirectX HLSL compiler, or Shazzam. 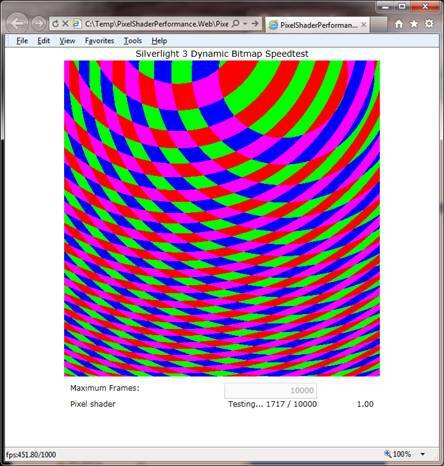 The compiled shader effect is loaded as a resource by a descendant of the ShaderEffect class. The article by René Schulte uses a custom derived class thereby showing how to transfer data into the shader during program execution. The loaded shader should be attached to the UIElement’s Effect Property. 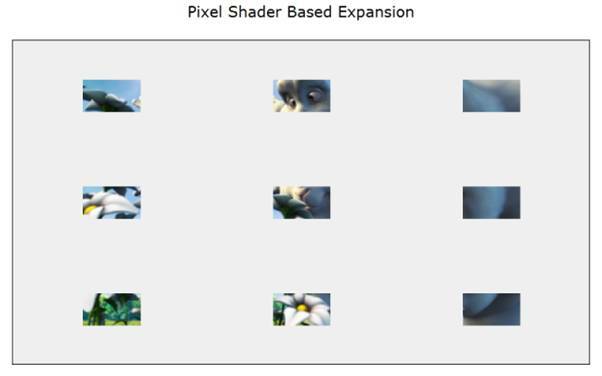 The shader will be executed for each pixel to be rendered. This gives you great control over the UIElement. You can modify many attributes of each pixel, for instance color and opacity. Do not forget that dropshadows are implemented as shaders, so you can also duplicate the UIElement visual. 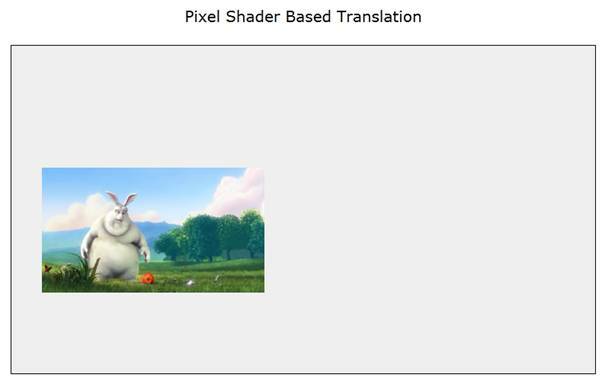 According to René Schulte, the program / pixel shader is not executed on the GPU. That may have been true for Silverlight 3, but in Silverlight 4 it is absolutely possible to put the GPU to work. So, with a bit of tweaking the code here and there we find a maximum performance of >450 FPS. 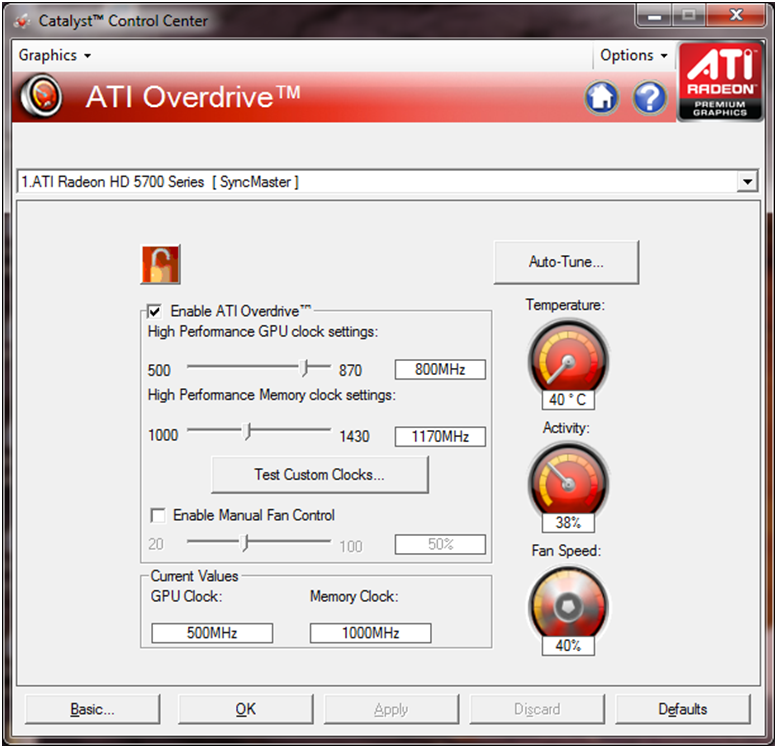 I’ve registered the GPU invocation for specific tasks using the Catalyst utility of my graphics card, see the fields ‘GPU Clock’ and ‘Memory Clock’ at the bottom of the screen shot below. Regular values are 157 and 300 respectively. Recently (April 13th 2011), Silverlight 5 Beta was released. It includes the DrawingSurface control which is a gateway into XNA functionality. A little experimenting reveals that like XNA the default drawing frequency is at 60 FPS, and you can’t seem to get it up by recurring calls to the OnDraw() event handler. In Silverlight the frequency is raised as described above. In XNA the default of 60 FPS can be lifted by setting both the Game’s object ‘IsFixedTimeStep’ property and the GraphicsDeviceManager’s ‘SynchronizeWithVerticalRetrace’ property to false. From the MIX demo video it is clear that performance is very good, however, at 60 FPS within Silverlight. The performce step is ‘made’ by the shaders and realized on the GPU. It is currently not clear to me how to measure that performance, so this exercise ends here for now. What performance can we expect? Is Silverlight slow, despite the extra tricks? What is the promise hidden in Silverlight 5? We now know that for demanding graphics we can turn to the integration of Silverlight with XNA. XNA, in turn is built upon DirectX. 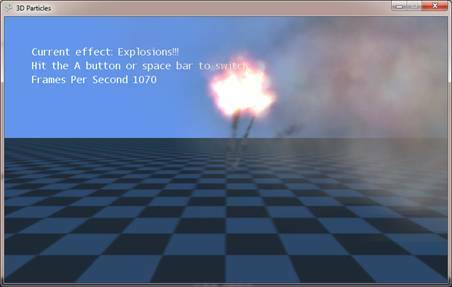 Below you’ll find a screenshot of a DirectX11 particle demo. For 16K particles (reminiscent of the 15K in the above particle demo) we see a performance of ~620 FPS (not measured with the same frame counter as with the other programs, however), immediately requiring maximum performance from the GPU. For 8K particles performance rises to ~1175 FPS. One conclusion I would like to draw here is that this performance correlates to the performance of the pixel shader used as a custom Effect. So, we may conclude that the real performance enhancement lies with the use of shaders. Will this performance hold up in XNA? 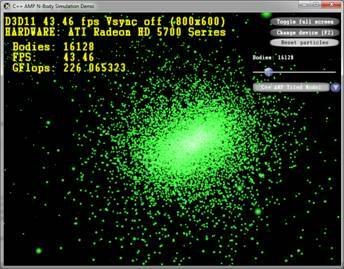 Yes, a particle simulation in XNA (from the XNA community, with small adaptation) brings us a ~1000 FPS performance, see screenshot. The above is an exploration of techniques and approaches to realize massive animation performance in Silverlight. It is not a methodological, comparative study. A more rigorous investigation into performance (of what exactly?) might be subject for a later article that builds on the findings presented here. Here we have learnt that in order to have massive animation in Silverlight we use the WriteableBitmap, the Blit operation from the WriteableBitmapEx Codeplex project, Procedural Animation programming, and pixel shaders (do not forget the enableGPUAcceleration setting, when applicable). We have seen that the exposure of XNA, built on DirectX, in Silverlight will most likely bring us further performance improvements. Today we can have a very powerful massive animation performance of around 400-500 FPS, and the future is bright.